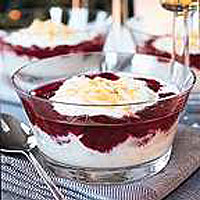 Not just for rice pudding fans, this wonderful dessert is flavoured with vanilla and brandy and enriched with cream before being layered in a dish with red fruit and slivered almonds. Red fruit is traditional in Scandinavia but apricot or apple compote are just as delicious. Bring the milk to the boil in a heavy saucepan then stir in the rice and vanilla pod. Cook, stirring for 5 minutes then cover and simmer very gently for 25 minutes until the rice is tender and the mixture has thickened. Remove the vanilla pod and leave to cool. Whip the cream until just floppy then fold into the rice with the brandy and sugar to taste. Layer up the rice and cherry compote in a glass dish or individual dishes and scatter with slivered almonds. Chill until ready to serve.